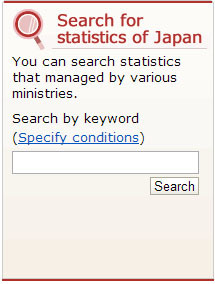 Resource: Portal Site of Official Statistics of Japan | What can I do with a B.A. in Japanese Studies? Are you a numbers junkie and interested in learning all about Japan? Look no further and explore the Portal Site of Official Statistics of Japan. The Portal Site of Official Statistics of Japan, also known as e-Stat, first launched in 2008 and promises to act as the “one-stop service for official statistics of the Japanese government” managed and maintained by the National Statistics Center. The site aims to gather information from statistical departments of Ministries and Agencies, and provide the general public with statistical data. Content available on the site is presented both in Japanese and English. At first glance, you can see that the site is divided into 3 major sections, Search for Statistics of Japan, Easy Access to Main Statistics, Learn Metadata. Let’s look at each section. Search Statistics of Japan would probably be the part that anyone who has little time to explore the site would go to first. It provides the uninitiated to data driven sites, the Google feel that many would gravitate towards if you had an inkling of what you were interested in researching. Considering the US Census American FactFinder and the CIA World Factbook, I took into consideration that as my initial statistical search data. The most common thing that I could consider searching is Population. When I typed that in the search box, I discovered something kind of weird, the first hit brought up Statistics About Road Traffic while the correct Population Census came up second. If you look at the Population Census, you can see that they have population census data available from as early as 1925 to 2010. The left side bar allows you to utilize facets in order to narrow results if you do get too many results to refine your results based on government statistics, ministries, statistical area, or period. 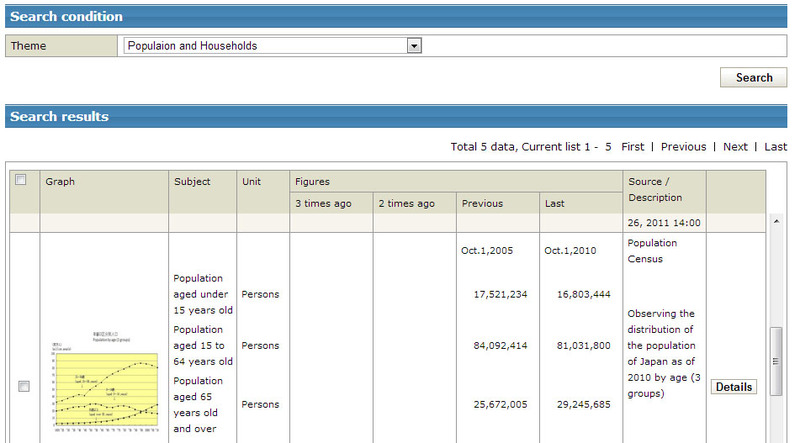 Selecting the 2010 Population Census, I changed my view of results from a hierarchy format to a list view. This allowed me to see how that data would be presented if downloaded, Excel, CSV, or PDF. (If you’re unfamiliar with CSV files, they can be read in a spreadsheet program.) After downloading the Excel file I was able to access the preliminary counts of the population and households. What’s helpful is knowing that you can simply click on the “Source” button to find out where the dataset originated. This would also be helpful when citing the data if writing for a paper. I know that many folks aren’t interested in looking scrolling through datasets and reading Excel files in Japanese to read information. With that in mind, I turned to Easy Access to main statistics. At first glance, I saw that this area was divided into Japan in Figures and Graphs, Main Economic and Financial Statistics, Statistical Compendia, Regional Statistics, and Thematic Map. The graphs and datasets presented are mostly in Japanese so if you’re reading levels are a bit rusty (like me), you’ll need to use a Japanese-English dictionary to make sure what you’re reading is correct. However, there are a number of graphs, charts, and maps available here to interest any Japanese sociologist or modern history scholar. The Learn Metadata section is only available in Japanese. However, you’ll be able to develop a better understanding of statistical classifications, area codes, and the survey item database in this section. There’s a lot of potential if using the English portion to the site. While it would be helpful for the datasets, charts, etc. to also be translated into English, I can understand why it wasn’t done. It’s quite expensive to pay someone, even an eager intern, to translate the enormous amounts of data available on this site. Data junkies will definitely enjoy the site and find some comfort in scrolling through many charts and graphs. Overall, the site does offer a lot of promise. I think what would completely win me over with the site is a compilation of data in the Easy Access to Main Statistics page similar to the CIA World Factbook on Japan. Simply organized and compiled data from the country of origin. I’m uncertain as to how popular this site is as you need to have moderate to strong fluency in both Japanese and English to navigate and utilize the data. I encourage you to explore the Portal Site of Official Statistics of Japan and share your own impressions of this database. This entry was posted in graduate school, study tools, undergraduate, useful links and tagged data, information, Japan, Japanese society, modern Japan, research, resources, statistics. Bookmark the permalink.